Providing you the best range of industrial drawer magnet, industrial magnets, rare earth magnetic grills, permanent grill magnets, industrial grill magnets and high gradient bullet magnets with effective & timely delivery. We are offering premium Industrial Drawer Magnet from our huge assortment of magnetic equipment. It is used in diverse applications that involve dry processing and consists of round magnetic tubes that are assembled in drawers. The alternative arrangement facilitates the product to cascade in zigzag pattern ensuring flawless capturing of tramp material due to direct and repeated contacts. We use the finest metal alloys and magnets to ensure dependable performance and offer this at leading industry rates. 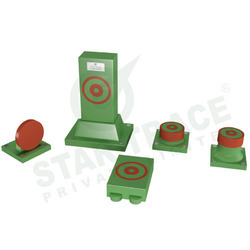 We are offering premium Industrial Magnets (Drawer Magnet) from our huge assortment of magnetic equipment. It is used in diverse applications that involve dry processing and consists of round magnetic tubes that are assembled in drawers. The alternative arrangement facilitates the product to cascade in zigzag pattern ensuring flawless capturing of tramp material due to direct and repeated contacts. We use the finest metal alloys and magnets to ensure dependable performance and offer this at leading industry rates. Rare Earth Magnetic Grills (Grill Magnets or Magnetic Grills) are available in various specifications to suit requirements across many different industries. Permanent Grill Magnets (Grill Magnets or Magnetic Grills) are available in various specifications to suite requirements across many different industries. 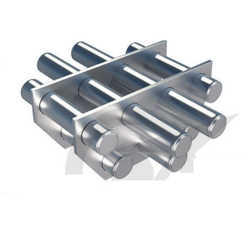 Industrial Grill Magnets (Grill Magnets or Magnetic Grills) are available in various specifications to suite requirements across many different industries. The High Gradient Bullet Magnets resemble a bullet in physical appearance and works in retaining ferrous impurities from substances that flow through it. In the field of magnets we are regarded as trusted manufacturers and suppliers of premium quality Magnets that are used for diverse applications. 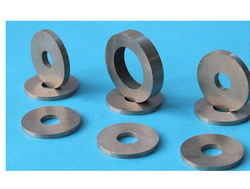 Ferrite magnets are made by combining strontium carbonate and iron oxide and are produced in form of rings, discs, blocks, and also as arcs for use in motors. We use state of the art technology for manufacturing these and maintain stringent norms of quality for flawlessness of end products. Rare Earth Magnets like Neodymium magnets (Nd-Fe-B) are composed of neodymium,iron, boron and a few transition metals. Samarium cobalt magnets (SmCo) are composed of samarium, cobalt and iron. These rare earth magnets are extremely strong for their small size, metallic in appearance and found in such simple shapes as rings, blocks and discs. In general, the elements are melted together and milled into a power that is dry pressed to shape in the presence of a magnetic field. The material is then sintered, aged, ground to dimension, magnetism and tested.They are called “rare earth“ magnets because the elements of neodymium and samarium are classified as such in the lanthanide’s section of the periodic table of the elements.These components rae used in rare earth magnetic drums. 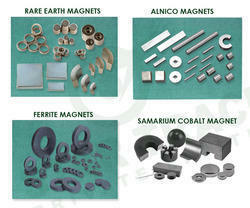 Alnico Magnets are made primarily from aluminium, nickel, cobalt, copper, iron and sometimes titanium. They can be either cast or sintered. Cast alnico melted and poured into a mold. Once solidified, the material is rough ground and then heat-treated and cooled, sometimes in a magnetic field. When treated in the presence of a magnetic field. The magnet is called anisotropic. This orients the material to take on maximum magnetization and allows a higher gauss level. A cast magnet that is not heat treated in magnetic field is called Isotropic. After heat treatment and cooling, the material can be ground to specific tolerances and then magnetized. Sintered alnico is made from a powdered mixture of ingredients that are pressed into a die under tons of pressure, sintered in a hydrogen atmosphere and then cooled either within a magnetic field or without (Anisotropic vs Isotropic). 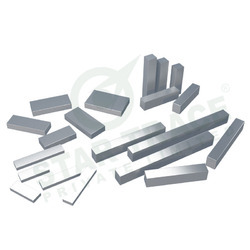 Ferrite Magnets are composed of strontium carbonate and iron oxide. They are charcoal gray in colour and usually appear in the forms of discs, rings, blocks, cylinders and sometimes arcs for motors. A powdered mixture of strontium carbonate and iron oxide is injected into either a wet press or dry press for forming. During this pressing process, a magnetic field is applied in the direction of preferred magnetization to orient the material and increase the magnet’s performance potential. This magnet is considered ‘oriented’. If not exposed to a magnetic field at the time of formation, it is called ‘non-oriented’ (Isotropic). After the molding process, the material is then sintered at about 1010°c. This process is similar to that of kitting ferrite pottery, thus the popular name ‘Ferrite’ magnet. Lastly, the magnet is finish ground to size with a diamond-bladed grinding wheel, magnetized and inspected for shipment. Star trace circular or rectangular type Hand Magnets allows to lightly change over the magnetic force just with one hand. Employing permanent magnets, this newly developed product ensures extremely powerful attraction. It can be used in a wide range of fields for machining, casting, food chemical processing etc. 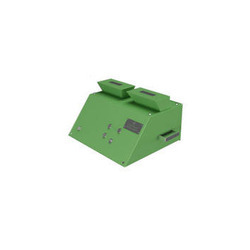 or for collecting the iron pieces scattered on the floor or mixed in the medium for putting and other operation. 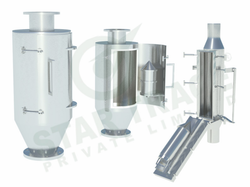 Besides this is conveniently applied to wide range of used in selecting and collecting iron powder from powder and granule materials even for household and educational uses. Ever last compact most simple and useful magnetic hole cleaner for removing iron particles from blind holes after drilling / tapping operations. Rectangular hand magnets economic type have been developed to meet laboratory/shop floor non-ferrous foundry shop etc. where iron cleaning is done manually the magnets is highly powerful encased in a steel flat body with handle. 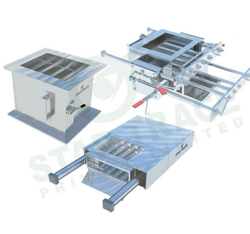 a non-magnetic hinged stainless steel flap is provided for easy cleaning of the accumulated tramp iron. the magnet size approx. 135x150 mm & 150x200mm and has a magnetic force to lift all pins/nails from 65 mm. 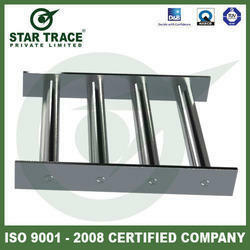 Magnetic sheet, magnetic roll, rubber magnet is widely used in bathroom, and used for window and door for air proofing. one size magnetized, the other UV coating, or two--side magnetized roll and sheets can be supplied to order. Specifications: can be customized in any size you want. Educational Magnet /ferrite magnet/teaching magnet is widely used in teaching and playing. 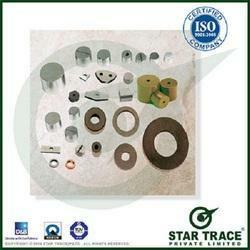 Cast alnico is used widely due to lower cost and good property. Many shapes, sizes and colours are available for clients' choice. We usually paint horseshoe magnet in red or blue, or we combine them with other material such as metal and plastic. Meantime, these products comply with the international safe standards. Educational magnet is safe to children's health. we manufacture educational magnets based on customers' requirements. 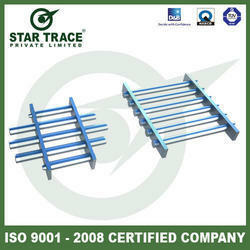 Brand Star Trace Pvt. Ltd.
especially for hold small work piece and keep on, when works in cutting. (magnetic holders). 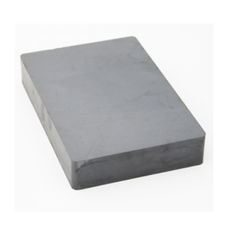 Samarium Cobalt Magnets alloys (generally written as SmCo5 or SmCo series 1:5) have one atom of rare earth samarium and five atoms of cobalt. By weight this samarium cobalt magnet alloy will typically contain 36% samarium with the balance cobalt. The energy products of these samarium cobalt alloys range from 16 MGOe to 26MGOe. These samarium cobalt magnets generally have a reversible temperature coefficient of 0.05%°C. Saturation magnetization can be achieved with a moderate magnetizing field. This series of samarium cobalt magnet is easier to calibrate to specific magnetic field than the SmCo 2-17 series magnets. In the presence of a moderately strong magnetic field, unmagnetized magnets of this series will try to align its orientation axis to the magnetic field. 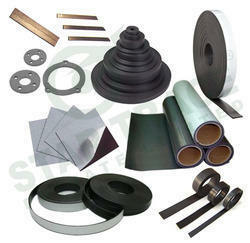 Flexible magnet covers a wide variety of magnet materials. The most common constituents in Flexible ferrite magnet material Barium Ferrite and Strontium. Most Flexible magnet material is produced in strip or sheet by extrusion process. Higher magnetic characteristic/performance. Flexible material is obtained either by work rolling/hardening in the rolling process or by including special additives to the chemical constituent. Flexible materials has a particular steady magnetic power and a smooth surface, which is a uniquely desirable combination of properties for many product designer with a lower cost, especially in flexibility and mach inability, no other magnetic materials has this characteristic comparable to it. Flexible materials is enough soft to be easily bent, twisted, coiled, punched, and otherwise machined into almost any shape without loss of magnetic energy. 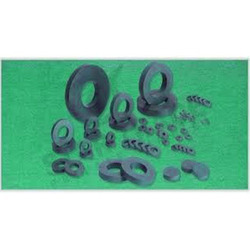 Rubber magnets are made of bonded ferrite magnet powder, compound rubber and other materials. By extruding, rolling or injecting, the combination can be made into soft, plastic and flexible magnets with different shapes which are depend on the request of clients. The major applications of rubber magnets are promotionl, decoration magnets for fridge magnets, toys,learning material. Funnel Magnets manufactured, exported and supplied by us have high gauss power and high reputation .Funnel Magnets made up of S.S. aluminium cylinder and used in many industrial application like ceramic, etc. Fine iron particles in ceramic will be removed using funnel magnets. 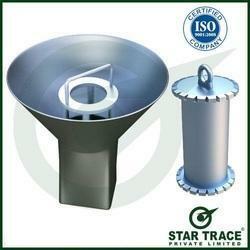 when ceramic passes through funnel magnet the iron particles will filtered. Funnel magnet available in both ferrite and rare earth magnets. We are reputed manufacturers, exporters and suppliers of an high gauss power funnel magnets.Funnel Magnets made up of S.S. aluminium cylinder and used in many industrial application like ceramic, etc. Fine iron particles in ceramic will be removed using funnel magnets. when ceramic passes through funnel magnet the iron particles will filtered. Funnel magnet available in both ferrite and rare earth magnets. Ring, disk, block, segment, ball, cylinder and so on; customized made. A low-cost alternative to other magnetic materials offers relatively high operating temperatures and good resistance to corrosion & demagnetization. However, it has lower energy levels (Br) and is brittle in nature. DC motors, louder-speaks, magnetic separators, automotive sensors, educations, etc. 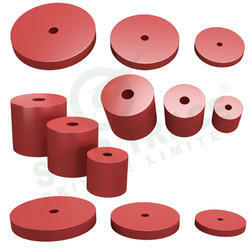 Pot Magnets are super strong, compact and durable which come in a wide range of dimensions. Max Working Temp. : Much depend on the material of the magnet,our ah grade material can reach 230 degree centigrade. Sintered neodymium (ndfeb) magnets are the most advanced commercialized permanent magnet materials today. With far better permanent magnetic performance compared with traditional magnets,sintered neodymium magnets are the key functional materials for modern industry. 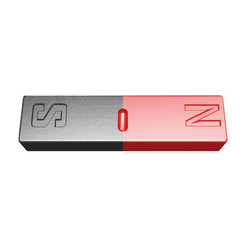 Bar Magnets are rectangular shaped magnets which have strong magnetic field and are available in different dimensions. triangle welding magnet or welding magnetic clamp is widely used in iron parts welding, jointing in 90oc or 45oc architecture and finish machining field and so on. 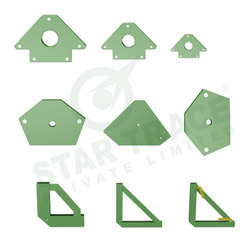 These high quality welding magnets are designed for quick and accurate positioning of parts during tack welding, layout and assembly processes, some common uses include positioning and holding work pieces and use during welding or general fabrication work. Magnetic welding clamps can be used on pipe, plate and tubing. 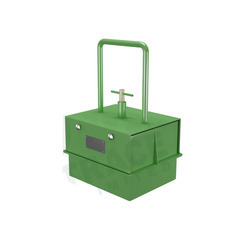 The range includes: magnetic holdfast and holders, magnetic positioners, magnetic mitre clamps, magnetic quick clamps, magnetic adjustable links, magnetic plate drags and earth welding clamps. they are the perfect solution for welders looking to improve work quality and reduce costly set-up time. performance: strong suction, easy to switch, in such a way, the work efficiency is advanced. Looking for Industrial Magnets ?